Everyone knows that foundation is probably the most important factor in makeup because it's the part that creates the initial blank canvas that you then build up to create whatever you want to. And number 3 is the biggest clincher for all three of my worries: I just never feel that I am wearing the correct colour for my skin tone. I can never remember if I need warm or cool, and I always get confused about whether foundations are warm or cool, and 9 times out of ten, I end up with a yellow-based foundation when I end up needing a more pink-based one. 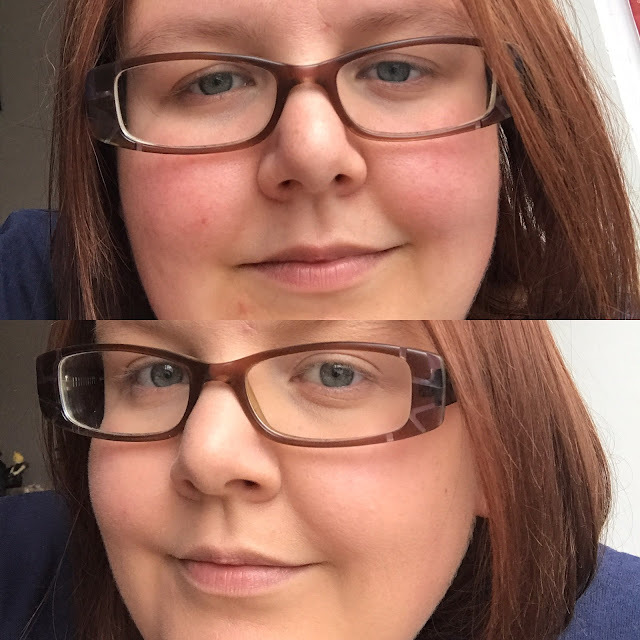 So when I saw that No.7's Beautiful Matte Foundation range has Ivory (my general foundation cool) as both cool and warm options, it seemed the perfect opportunity to test both next to each other. And, as the title of this review probably gives away, yes, I ended up getting the Cool Ivory. I personally have never come across a range that actually labels its shades as cool or warm, with the same colour in both options, so that was incredibly refreshing for me. One thing that bugged me a little about this foundation, is the fact that it cost £15 (which is pretty much the going rate for a foundation), but the packaging just didn't feel like £15 quality to me. It felt cheap, and the pump, in particular, feels quite flimsy. I can imagine it breaking really easily, which is a little disappointing. Okay, so I started off by applying primer. For this, I decided to use my Bourjois Matte Serum Primer purely because it's about to run out and I just want to finish it. I'm not a huge fan of this primer, as I find it quite "flaky" but for the purpose of this review it was fine. "Dot a little foundation where you need it most, usually your cheeks, nose and chin. Blend into the skin with a foundation brush in a small circular motion, working downwards and outwards from the centre of your face." I applied the foundation using the F80 Flat Topped Kabuki Brush from Sigma, which is the only foundation brush I ever use, because I love it so much. The foundation applied really nicely and evenly, blending well. One of my biggest errors is that I have a habit of applying in layers that are too heavy, but I think dotting a small amount on my forehead, cheeks, chin and nose it helped me to only use a small amount. I ended up applying a second layer that I dotted into areas that were still showing a little redness, generally around my cheeks. I also applied more just below my eyes and above the eyebrows because I think I have a slight tan that hasn't got to my eyes (y'know because of sunglasses) so my eyes are a slightly different tone so I wanted to blend the colour out a little. My biggest problem areas are essentially covering redness, predominantly on my cheeks, hiding spots and evening out the skintone. I don't have any major problem areas, as I am lucky to have fairly good skin these days. But it's easy to see the difference from just a light amount of coverage. Overall, I am really happy with this foundation. For the small amount used, the coverage was perfect for me and it blended out nicely and my skin feels really nice. It doesn't feel heavy which I absolutely love in a foundation, because I prefer to not be able to feel that I'm wearing any. The only thing I will say is that for a product that is "oil free", after a while, my skin has started to feel a little bit oily, so I'm not sure I'd recommend this for use during hot weather, despite the promise of SPF 15 on the bottle. Disclaimer: Although different angles, both photos were taken in the exact same location, roughly 20 minutes apart so with the same lighting in both. The lighting is through a window rather than artificial lighting, and absolutely no filters and post-editing has been applied to any of the photos. The product was purchased by me, with my own money.